Perhaps you've seen the Midas commercial that offers a complete brake job for $99? Is it really possible to get brakes done this cheap? Most people's experience would suggest no. We must remember, that for Midas, their advertisement is just that: an advertisement. It's marketing to get you in the door. While not a lie, there's probably very few vehicles that can be serviced for that price. So what's a good price for a brake job? If it's only pads that you need, and a common vehicle, you should not expect to pay more than $150-$175. This amount represents the cost of parts plus an hour of labor, and should include servicing (turning) your current rotors. Rotors do wear out though, and that may cost an additional $100-$150 if they've fall below minimal service thresholds. But what if I told you a secret? What if I told you most brake jobs involve removing only two bolts (not including the lug-nuts on the wheels)? What if I told you that you could probably source rotors and pads on the internet and install them yourself for under $85? That's right, if you can remove two bolts, place an order on Ebay, and are willing to trade a bit of dirt under the fingernails for some financial savings, then replacing your brake pads is easy (note, rear brake shoes are bit more involved). 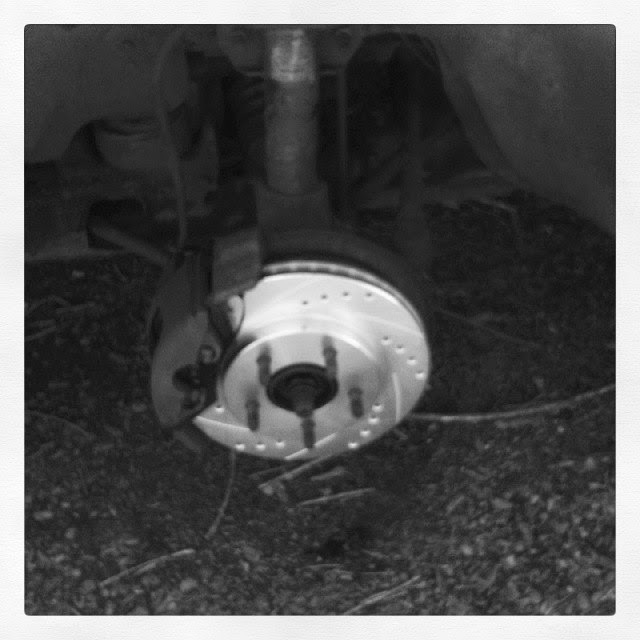 Recently I replaced the brakes on my car for around $85, and this included new high-performance cross-drilled and slotted rotors. The rotors, I purchased on Ebay for $69, and the pads from Advance Auto for $14. Swapping them out just takes a few minutes. Order two rotors from Ebay, or your local merchandiser. Order a set of brake-pads, and brake pad pin grease (they come in little packets for about $1). Jack up the car, and remove the wheel. Remove the two caliper bolts from the back of the caliper. These may be a Torx bit which can be purchased from your local autos-tore. Remove the calipers and pads, note how the pads attach. Tap the rotors off the spindle (some rotors may be held in place with Phillips screws). Replace the rotors spraying them with brake cleaner to remove anti-rust oils from the factory. Compress the caliper piston with an old brake pad and a c-clamp (or alternatively you can rent a caliper tool at your local auto-parts store for free). Install new pads, grease caliper pins (the bolts), and tighten. Please remember though, that despite the fact many people do get ripped off on brake jobs (paying $1000 or more), there are honest shops performing quality work with good prices out there. 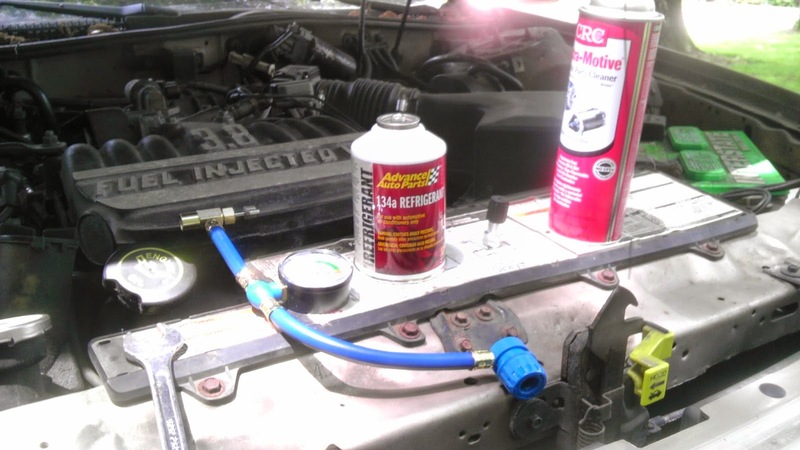 Mechanics assume a certain amount of risk when servicing vehicles. This includes removing difficult to remove bolts, and the possibility that if something breaks during the service (for example, a brake hose being damaged), they're responsible. Personally I like the idea of brand new parts (e.g. rotors) on my vehicle, instead of resurfaced rotors. It also makes the installation process simple for the shade-tree mechanic. One might suggest that the process of transferring the cost of a brake job from parts to the servicing of rotors, is the most convincing evidence that brake jobs are huge money makers for mechanics (and maybe a tad bit of a ripoff). It's technically more time consuming, and possibly more expensive to you. As long as you choose to recycle the rotor, if the price of new rotors is equal or less than turning (the term used for servicing rotors), it is my opinion that a new rotor is always better.